My garden hasn't changed a whole lot from last week, but still, I like to chart the progress of how things are going. 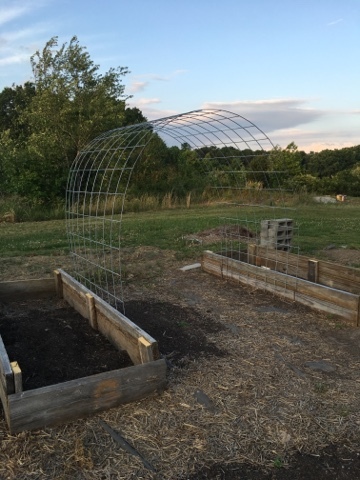 My sweet love fixed the trellis for me this past week, now to fill the beds and to get the green beans in the ground. I am SO excited and I LOVE how it turned out! A wonderful mother's day gift for sure!!! 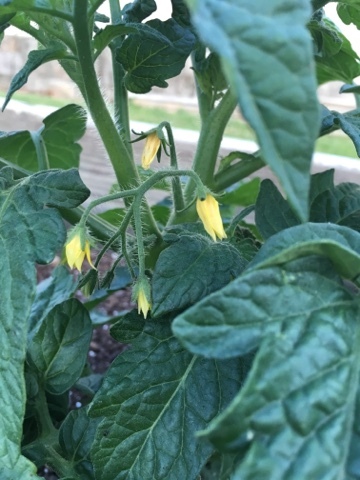 My first little tomato blooms. Hooray! I asked the guys to build me a strawberry bed, but try to use only what we had available to build with. We are trying to keep costs down in every area we can. 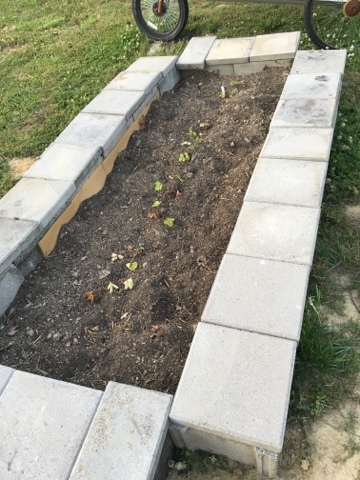 So they laid down some cardboard to help kill the weeds and grass underneath and then they laid down some of our old cinder blocks and then topped them with some pavers we had laying around. We have used cinderblocks in the past for our raised beds, and they work well, but they can have weeds grow up through the holes. So topping them with pavers worked beautiful and I think it turned out wonderfully! Hydrangea season!!! Eek! Look at this beauty! Pinkish purply and blue! LOVE!!!! It is going to be so beautiful when it is in full bloom, it is already gorgeous now. 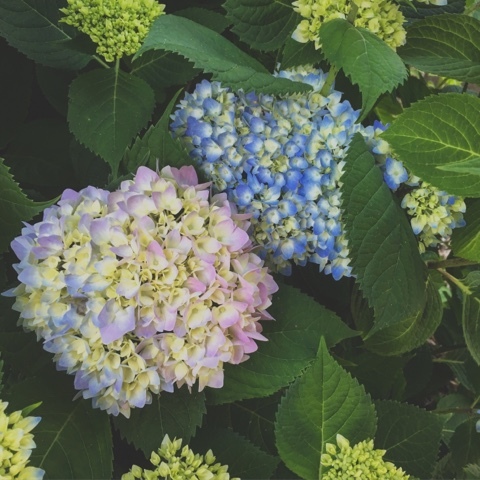 I adore hydrangeas. ADORE!!! 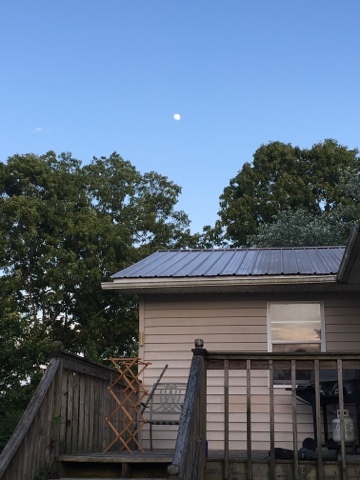 A pic of the sky and my back deck. I love the blue and the green... plus there is my little yard sale find, the drying rack. I've been without one for a couple of years now. 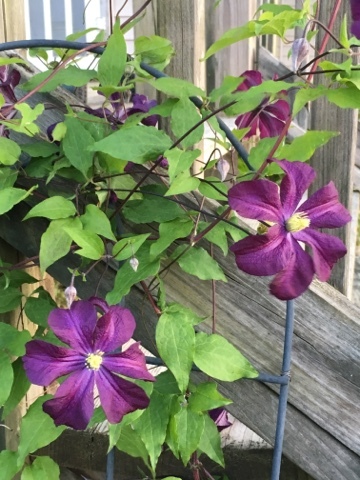 And just because I love how pretty it is... another picture of my clematis. More blooms this week and plenty more buds ready for blooming. I hope it continues and continues for weeks! So, not a big update this week, but still, many exciting things going on as we build and move and grow in our little homestead and garden. All of it is wonderful. I love cinder block gardens, and your trellis is just waiting for seeds to sprout! I have a drying rack out back on the sidewalk where the sun shines hot! I never tire of seeing your little happy homestead. So glad that you are posting more again. I check every day and enjoy your cooking, crafting, gardening and wisdom. Blessings, Carolyn in Fl.